Ana has found that this bear is a GOFFA. See photo near the bottom. My son is 2, and he has a teddy bear he is attached to that he got as a gift about a year ago. 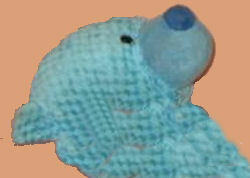 It is a light blue bear with somewhat of a checkered designed body. The “fur” on it makes it look this way. The only thing on his body is a bow tie that is sort of a plaid design to match the color of the bear. I have seen one exactly like it, but in the wrong color in a crane machine game for Sugar Loaf. He will not part with this bear, and I have had to wash him, stuff him, and sew him up. I don’t believe that he will make it through too many more washes. I have tried to replace it with other animals, but my son will just not have it. He has to have this bear to sleep. I was hoping to find him another one before this one is completely unfixable. The woman who gave it as a gift says she got it from a store, and we have had no luck finding it. I have searched for months with no luck on finding another one because the one he has, has seen better days. I appreciate any help. If you can help Sarah find this Sugar Loaf? 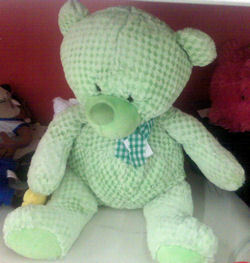 GOFFA Blue Diamond Patterned Bear, THIS SITE IS NO LONGER ACTIVELY MANAGED. Please use Our FREE FACEBOOK GROUP, including #100208-2 in the subject, . Thanks! I edited the post to include your photo and a link to your listing. You’re right, it does look closer, except for the eyes. It just has to be a Kellytoy!! This is the rabbit I have. I have been looking for another one to have to keep it fresh. The only difference is mine is orange and yellow tie-died. Does anyone have any idea where I could find an orange one… Or this blue one? eBay does not show that the rabbit was sold through them, so Tonya may still have the blue one. You might want to write her and ask. 100% positive by Goffa Int’l Corp. I don’t have any way to contact Jen. Maybe she’ll see your comment Ana. Jen, check your local Goodwill. I saw a second one yesterday… but in pink. Perhaps they just received corporate donation? BTW, the bear actually has stitched claws on feet. They had come undone on the green bear. Sorry… previous post is meant for Sarah, not Jen. Jen, save my email for future reference. It’s recis77 at yahoo dot com. I have the yellow-orange tie dye version. Diamond pattern is smaller scale than the blue version. I have located the blue Goffa bear with blue plaid bow. Email me at recis77 at yahoo dot com if you’re still looking, so I can send you pictures.